Question: Maria Rita and Claudio – we would like to know more about your lives … so your clients around the world know more about the people who produce your fine products and how you came to be in this business. Q: Maria Rita – How did you get started in this business? A: Both Claudio and myself have started working with electronic organs at the end of the 1970s. Q: Claudio: - Did you make some electronic studies before you started working? A: Yes. I made various studies including completing a 5 year course at the technical/electronical institute. A: Maria Rita – After the electronic organ company closed, Claudio and I have both taken on jobs in other companies. I went to work in an accordion company and Claudio went to another electronic company. So for several years, our working relationship was interrupted, until a few years later, when we ended up working again in the same company where we worked until the decision was made to open our own business. Q: Maria Rita and Claudio – When did you decide to open Musictech? As we have been working together for many years in different companies and always had such a good relationship between us, we decided in 1994 to open up our own business which we named: Musictech. Q: What inspired you to choose the name MUSICTECH? A: We wanted to dedicate our knowledge of technology to music. We wanted a name, that is easy to pronounce, all over the world, and also a name that accelerates / excites minds…. so we combined Music and Technology and created MUSICTECH, emphasizing in 2 different colours the two concepts. 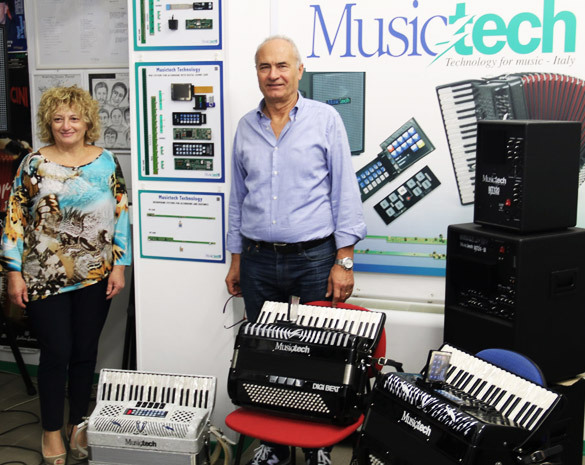 We chose the accordion as OUR instrument to focus on and to work with, for supplying technology to the instruments produced here in our home in Castelfidardo. The first evolution in our project was, when we started to replace the physical attachments with sensors which was a real boom development at that time. Q: Who is projecting all your innovations? A: Our innovations are all projected within our the company. Some of our technical specifications are realised in different external laboratories and then, these are applied in our company to the final product. Musictech Frankfurt Musikmesse 2016, Fabrizio Malerba (guitar) Mario Gatto & Paolo Miles (accordions). Q: Did you start your business here in these premises? Yes – when we started, we wanted to choose a "central" place, that was just as our name – "easy" to find and we are very happy to be here in the heart of Castelfidardo. This production place was completely empty and we were eager to put all into place. Q: Were you worried opening a new business? A: Claudio - Actually we did not have a lot of preoccupations. We were so sure of our product. Maria Rita and I had known each other and worked together for a long time and were confident in our working collaboration. We wanted to make innovations that were in our minds and needed only to be realized. This gave us mental power and a strong feeling of product creativity. Q: Courage indeed, as many times it is not enough to have only mental power. The appeal of the product and economic factors can be vital too? A: Working already for some time in the electronics business and accordion manufacturing, we had many contacts with all the companies from this area. They have given our company, ourselves and also our products, a lot of confidence, which has given the possibility for Musictech to grow! Of course we also had to consider, that we have and will have competitors, but never the less, we wanted to become a strong reference point for all accordion producers, that wanted to amplify their accordions. Maria Rita Bartomeoli & Claudio Sabbattini, Harley Jones & Holda Paoletti-Kampl. Q: What makes you both so creative? A: It’s actually the artists and clients, that help us and oblige us to think and create new features. So when we presented our first digital accordion…… the artists had to get an additional expander or keyboard, which made it complicated to use, high cost and heavy weight! So in order to perform during an evening, the artist had to carry with him many things. In order to avoid all the above mentioned, we decided to make a Digital Box, that can be joined directly with the accordion through using a USB stick. Artists coming from all over the world are asking us to create their rhythm and now we can proudly say, that we have about 56 different types and our next product "arrangements for the accordion" is ready to be presented and launched! You are welcome to visit us on our stand to experience the "New World of Musictech Electronic MIDI Accordions" - the exceptional Dual Link DIGIBEAT complete with Arrangements and Rhythm section. Q: How do you comunicate with the artist? A: Not all artists are coming directly to our factory, therefore the internet has made communication so much easier and simpler. With internet we can reach places, that we have never thought we would and we also travel, usually to the stronger selling countries. Q: Do you think that the digital accordion proposed by Roland has had a positive affect for your business? A: Yes – definitely, as the Roland Accordion was highly advertised coming onto the market, the general promotion of electronic / MIDI usage was also positive for MusicTech, even though the Roland product is a different product than ours. Q: How do you see the future of your work? A: Selling has changed over the years and with internet now being in every single corner of this world, big distributions are no longer normal. Our customers will mainly be the single buyers coming from all different places. As long as our business continues to listen to the artist/client and creates reliable products that clients are requesting and wanting, making their performance easier and improved with our products – we do not worry for the future and in fact, feel very confident for the future, as we see our brand continuing to be played. A: We have about 45 products to offer and of course our digital amplifiers and microphones are a very important part of our production! Q: Some important events, that you enjoy looking back too? A: We have been chosen in 2013 by the Italian organisation «Confartigiananto» to present our products in the USA during the Italian Design Week 2013 in San Francisco, California. We were chosen for our innovative technology in combination with tradition. An important target/goal and yes – we cannot deny, that being recognized like that, filled us with some pride! As well, we appreciate the many other awards our work has received. Q: Do you have family members that have your same spirit of technology? Both Maria Rita and Claudio smile….. They both have grownup children but none of them have joined the family business. We appreciate their personal effort for succeeding, especially at these difficult moments and that their success leaves us as parents, free to concentrate ourselves on creating and improving products and guiding our company. A: Our small business is entirely run by us. We are following up with all our customers, we are preparing all our advertising documentation including text and images. Our administration and book keeping is in the hands of Maria Rita. We have developed special softwares, that allows us to control and handle our business in a fast and efficient way. Q: Claudio - What is the secret of your business? No secret really. The energy and a great “can do” attitude. Our business cannot look back on a long history, as the accordion itself can. This is for us and for me personally, a big focus and inspiration, to go and develop and create further and further and see our innovations expand on the market and see our customers, not as customers, but as collaborators. Q: Maria Rita - What do you like best about your business/industry? I can’t really say, what I like best, as I have been through all steps of this business, as well as starting my working experience as a worker in electronics and also accordion manufacture! I started with Claudio to project and finalize our ideas, just as I have been working in our production here and handling all administration work. This is what I am mainly doing now! Administration has become an important part of our work, as with Internet, we are not only working with local manufacturers, but having worldwide connections. If I would have to give one final answer to your question – then I can and want to say, that I am proud – proud to be here after 22 years in MusicTech and to say thank you to all our customers who have given us praise and encouragement and are always wanting to learn about our new features and products.